Secure, integrated encryption and backup solution. Is there a better alternative to Knox? Is Knox really the best app in Security category? Will Knox work good on macOS 10.13.4? Note: Knox is no longer for sale, and is only provided here for those who need to access it for purposes of reinstallation. Knox is a uniquely integrated encryption and backup solution that makes securing your files easier than ever. Create as many encrypted vaults as you want, each with separate passwords. Then schedule automatic backups. You can even reformat USB sticks and external drives as encrypted Knox vaults - moving files between Macs has never been so simple and secure. Fixed problem where Knox would crash on launch in Mac OS X 10.11 El Capitan Beta. Fixed problem where Dock icon would high bounce on launch. Fixed problem in the auto-updater where Beta builds would be included even if the preference was set otherwise. 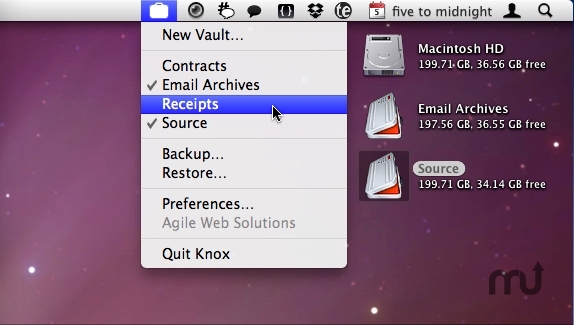 Knox uses the OS X encrypted disk images feature, the technology behind FileVault, to protect your data. This means that your vaults are encrypted by the U.S. Government's new Advanced Encryption Standard (AES) with 256-bit or 128-bit key length. The AES algorithm is secure, but don't take our word for it: even the NSA has found its strength to be sufficient for protecting classified national security information. The implication? Your data will be safe whether it's a rogue kid or a rogue nation going after it. And because the encrypted disk images are supported as standard in OS X, Knox vaults - including whole disks encrypted with Knox - can be opened even without Knox installed.